Climate change is no joke: 2016 was the hottest year ever recorded, and experts think our planet hasn't been this warm in about 115,000 years. 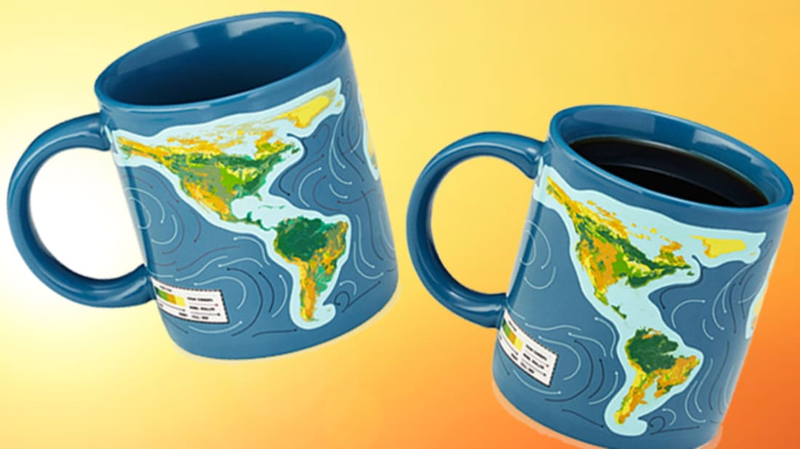 As Earth's temperature continues to rise, things are starting to look very different—and now those changes are being depicted on this foreboding mug. The heat-sensitive cup shows how global warming is changing our planet's landscape, and how it might continue to do so in the future. Once you add a hot liquid, the water levels rise and the edges of the continents begin to fade away (bye, Florida!). As water floods the outer parts of the land, the lush green continents begin to turn into dire shades of brown and orange. As with all heat-sensitive mugs, you should never pop this item in the microwave or dishwasher, as extreme heat messes with the technology. Instead, give this environmentally conscious cup a sponge bath in the sink. You can grab a mug for yourself or a fellow treehugger on UncommonGoods.